Staining of human peripheral blood lymphocytes with low endotoxin Mouse anti Human CD49d antibody, clone 44H6 (MCA923EL). Staining of human peripheral blood lymphocytes with Mouse anti Human CD49d antibody, clone 44H6 (MCA923). Staining of human peripheral blood lymphocytes with FITC conjugated Mouse anti Human CD49d antibody, clone 44H6 (MCA923F). Staining of human peripheral blood lymphocytes with RPE conjugated Mouse anti Human CD49d antibody, clone 44H6 (MCA923PE). RPE conjugated Mouse anti Human CD49d antibody, clone 44H6 (MCA923PE) used to evaluate CD49d expression on human brain derived cell lines by flow cytometry. Brain-derived cell lines express markers for mesenchymal stem cells and pericytes but not for glial or neuronal precursors. 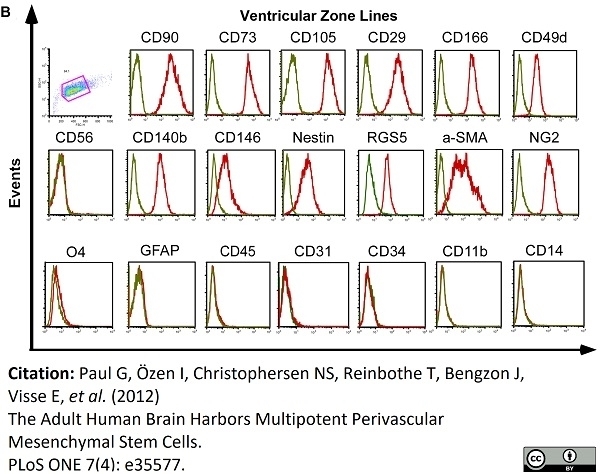 (A) Representative histogram of flow cytometry analysis of cortical line and (B) ventricular zone line. Progenitors from all donors and both regions highly express MSC (CD90, CD73, CD105, CD29, CD166 and CD49d) and pericyte markers (CD140b/PDGFR-β, RGS5, CD146, Nestin, α-SMA and NG2). 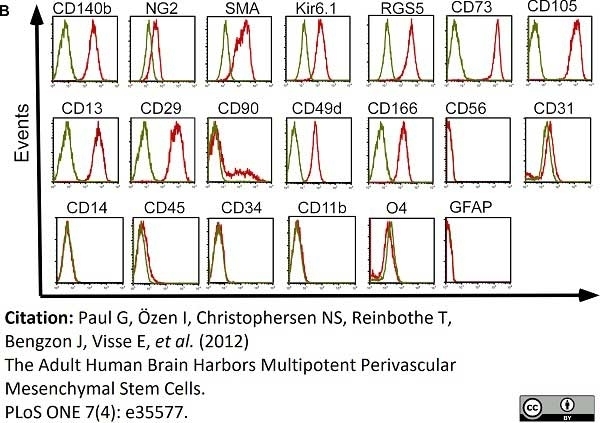 They do not express hematopoietic (CD45), endothelial (CD31, CD34), microglial (CD14, CD11), glial or neuronal precursor cell markers (GFAP, O4) or myofibroblast markers (CD56), (green = isotype, red = respective marker). RPE conjugated Mouse anti Human CD49d antibody, clone 44H6 (MCA923PE) used to evaluate CD49d expression on human clonal perivascular MSC progenitor lines by flow cytometry. Characterisation of clonal perivascular MSC progenitor lines. Mouse anti human CD49d, clone 44H6 is reported to induce homotypic aggregation of pre-B cell lines including HOON and NALM-6 (Letarte et al. 1993). HOON pre-B leukaemia cell line. Spleen cells from immunised BALB/c mice were fused with cells of the SP2.0-Ag14 mouse myeloma cell line. 1Overnight incubation with clone 44H6 is recommended for optimal results. The epitope recognised by this antibody is reported to be sensitive to formaldehyde fixation and tissue processing. Bio-Rad recommends the use of acetone fixation for frozen sections. Use 10ul of the suggested working dilution to label 100ul of human whole peripheral blood. Use 10ul of the antibody to label 100ul whole blood or 106 cells in 100ul. Quackenbush, E.J. & Letarte, M. (1985) Identification of several cell surface proteins of non-T, non-B acute lymphoblastic leukemia by using monoclonal antibodies. J Immunol. 134 (2): 1276-85. Letarte, M. et al. (1993) Homotypic aggregation of pre-B leukemic cell lines by antibodies to VLA integrins correlates with their expression of CD9. Hartz B et al. (2011) α 4 integrin levels on mobilized peripheral blood stem cells predict rapidity of engraftment in patients receiving autologous stem cell transplantation. Eigenmann, P.A. et al. (1999) The mucosal adhesion receptor alpha4beta7 integrin is selectively increased in lymphocytes stimulated with beta-lactoglobulin in children allergic to cow's milk. J Allergy Clin Immunol. 103: 931-6. Rabe, H. et al. (2011) Higher proportions of circulating FOXP3+ and CTLA-4+ regulatory T cells are associated with lower fractions of memory CD4+ T cells in infants. J Leukoc Biol. 90: 1133-40. Seoh, J.Y. et al. (2001) Cell cycling status of human cord blood CD34+ cells during ex vivo expansion is related to the level of very late antigen expression. J Korean Med Sci. 16: 20-4. Seoh, J.Y. (2001) VLA-4 expression and cell cycling status during ex vivo expansion of human cord blood CD34+ cells. Dogan, A. et al. (1997) Expression of lymphocyte homing receptors and vascular addressins in low-grade gastric B-cell lymphomas of mucosa-associated lymphoid tissue. Am J Pathol. 151: 1361-9. La Heij, E. et al. (1998) Adhesion molecules in iris biopsy specimens from patients with uveitis. Br J Ophthalmol. 82: 432-7. Humphries, J.D. and Humphries, M.J. (2007) CD14 is a ligand for the integrin alpha4beta1. Grindebacke, H. et al. (2009) Dynamic development of homing receptor expression and memory cell differentiation of infant CD4+CD25high regulatory T cells. Kim, T.J. ,i>et al. (2010) Suppression of human anti-porcine natural killer cell xenogeneic responses by combinations of monoclonal antibodies specific to CD2 and NKG2D and extracellular signal-regulated kinase kinase inhibitor. Stadlmann, S. et al. (2003) Disruption of the integrity of human peritoneal mesothelium by interleukin-1beta and tumor necrosis factor-alpha. Woolhouse, I.S. et al. (2005) Endothelial interactions of neutrophils under flow in chronic obstructive pulmonary disease. Eur Respir J. 25: 612-7. McGilvray, I.D. et al. (1997) VLA-4 integrin cross-linking on human monocytic THP-1 cells induces tissue factor expression by a mechanism involving mitogen-activated protein kinase. J Biol Chem. 272: 10287-94. Sakamoto, T.M. et al. (2013) Altered red cell and platelet adhesion in hemolytic diseases: Hereditary spherocytosis, paroxysmal nocturnal hemoglobinuria and sickle cell disease. Zucchetto, A. et al. (2012) The CD49d/CD29 complex is physically and functionally associated with CD38 in B-cell chronic lymphocytic leukemia cells.